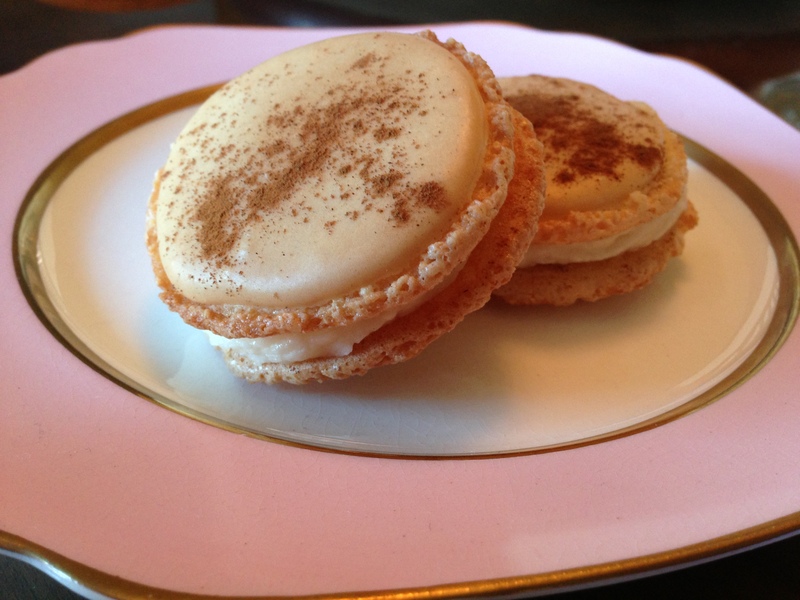 Macarons are a luxurious treat, therefore, obviously one of my favorite indulgences. But, a financially responsible lady cannot afford to purchase these yummy (but pricey) treats too often, as one macaron can range from $1.50- $4.00. And, as it’s impossible to eat only one, the expense can rack up! So, what does a resourceful lady do? Well, she makes her own of course! Although the process is quite a finicky and delicate one, it is incredibly satisfying. There are a few methods to making macarons (French and Italian) and testing these processes, inventing flavors and individually decorating is quite fun! 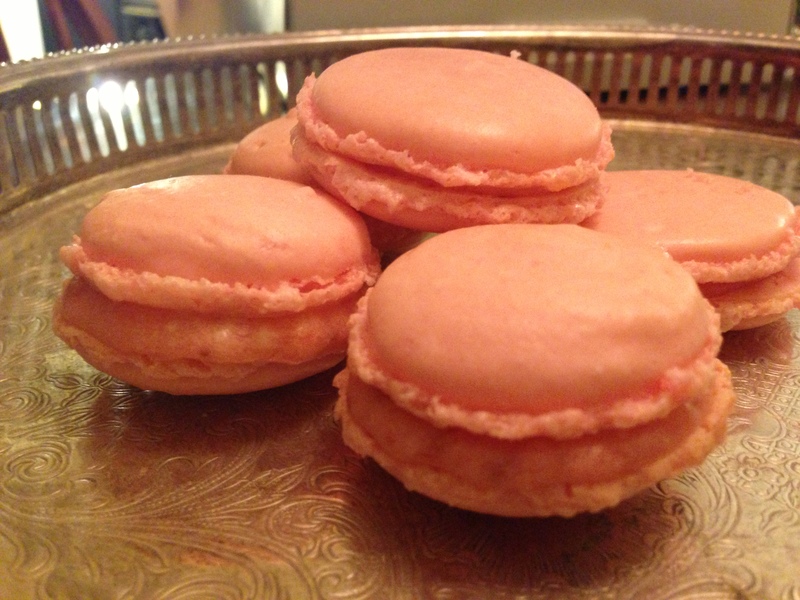 Here is a step by step overview of the French method to making delicious macarons! 1. Assemble your ingredients. 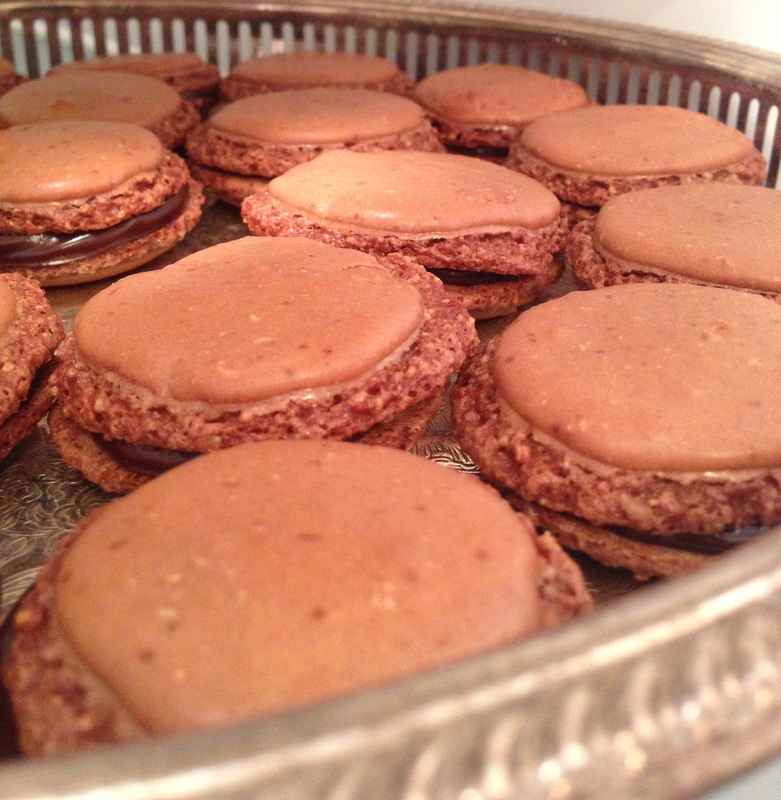 This is the recipe for a chocolate macaron with chocolate ganache. 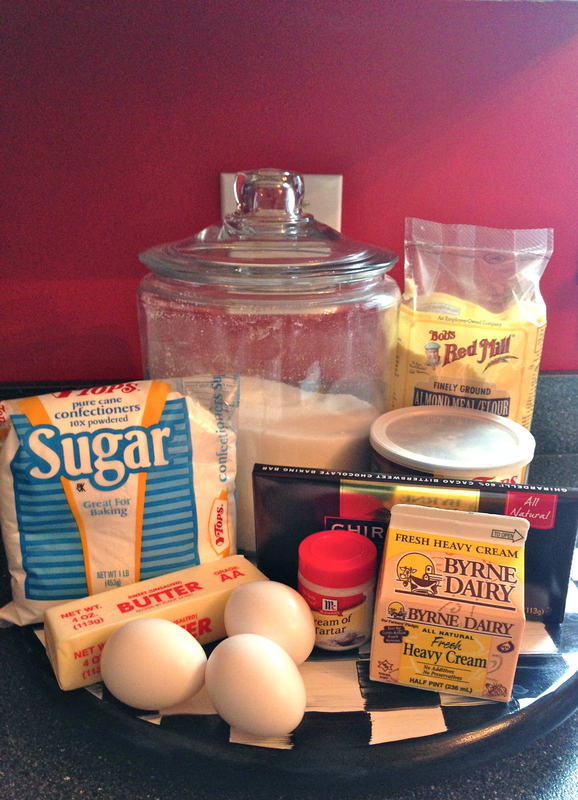 Depending on your recipe the ingredients will slightly vary but these are the staples. 2. 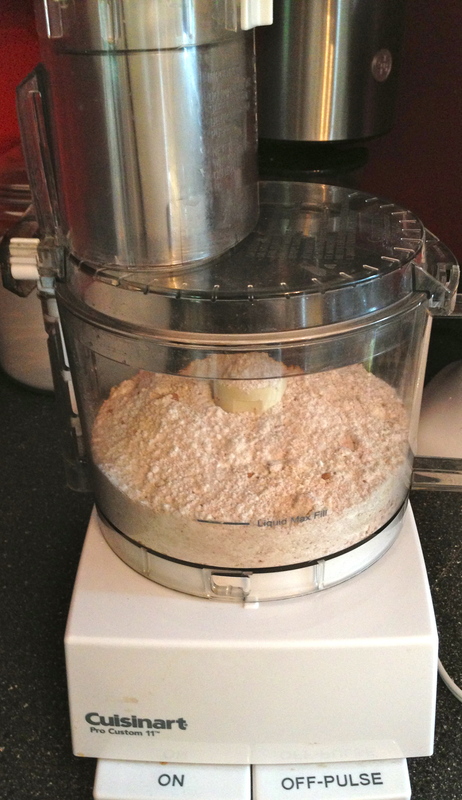 Combine powdered sugar, almond meal/flour, salt and cocoa powder in a food processor. Pulse the blade a few times to aerate and mix the ingredients. This will make the shell smooth and light. 3. 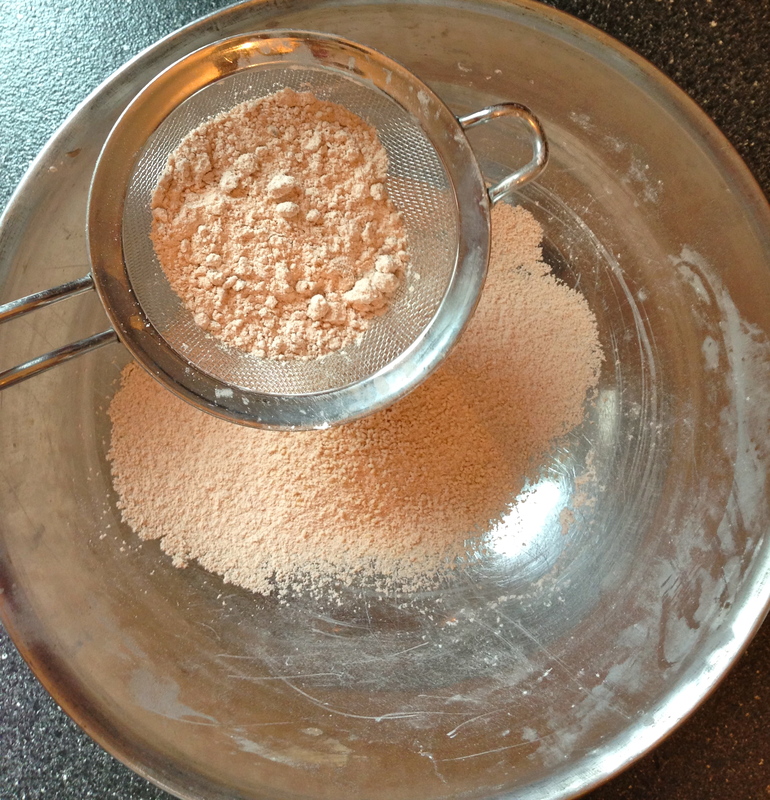 Sift the combined ingredients into a bowl. I often do this twice to ensure the dry particles are as small as possible to create the smoothest shell. Set aside. 4. Fit your mixer with a wisk attachment. 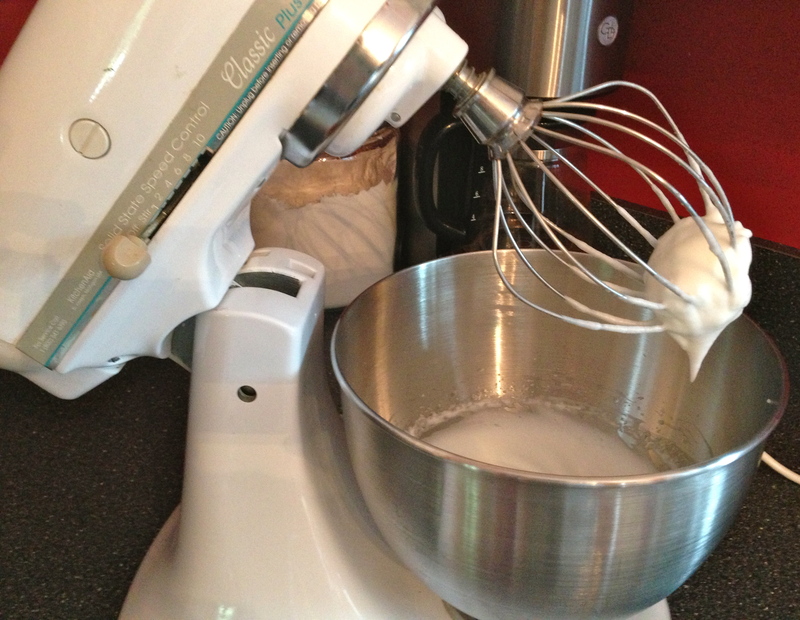 Place egg whites in the mixing bowl and beat on a medium setting until foamy. Add cream of tartar and continue to beat until egg whites become opaque and white. Slowly add in granulated sugar and beat until the egg whites hold stiff peaks. 5. 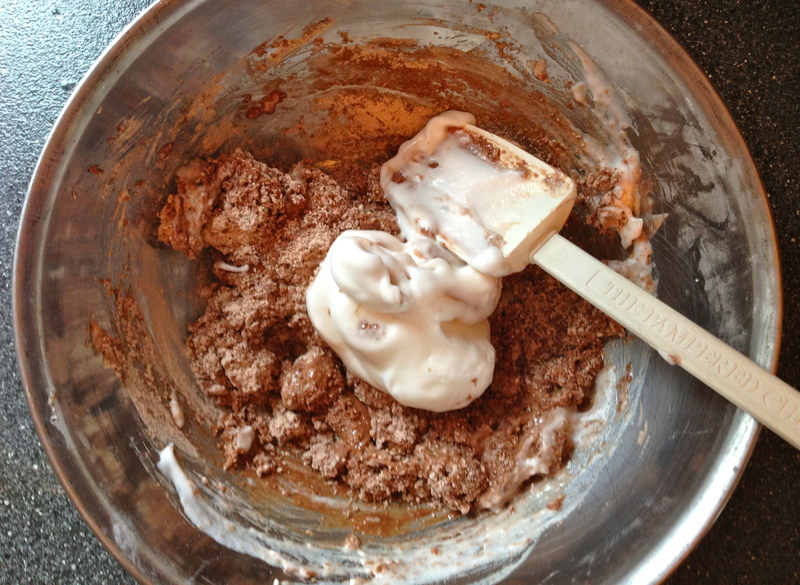 Using a spatula, fold the egg white mixture (meringue) into the dry ingredients. Fold until the meringue deflates and the consistency of the mixture mimics a cake batter. 6. 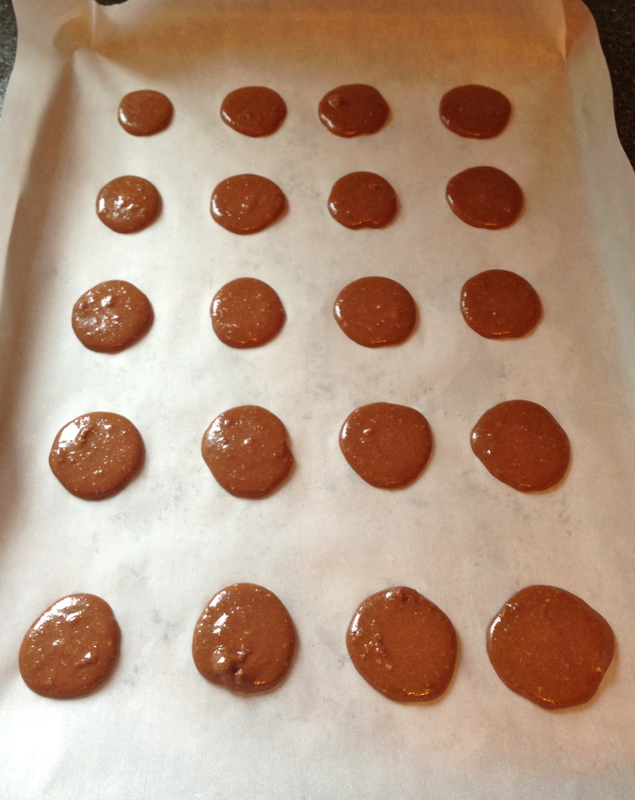 Transfer the batter from a pastry bag/ziplock bag onto a wax paper lined baking sheet and pipe out 1 inch rounds. The next instruction is very important. Hit the baking sheet against your work surface a couple of times. This will create the signature base or foot of the macarons. It will also rid the shell of air bubbles! 7. 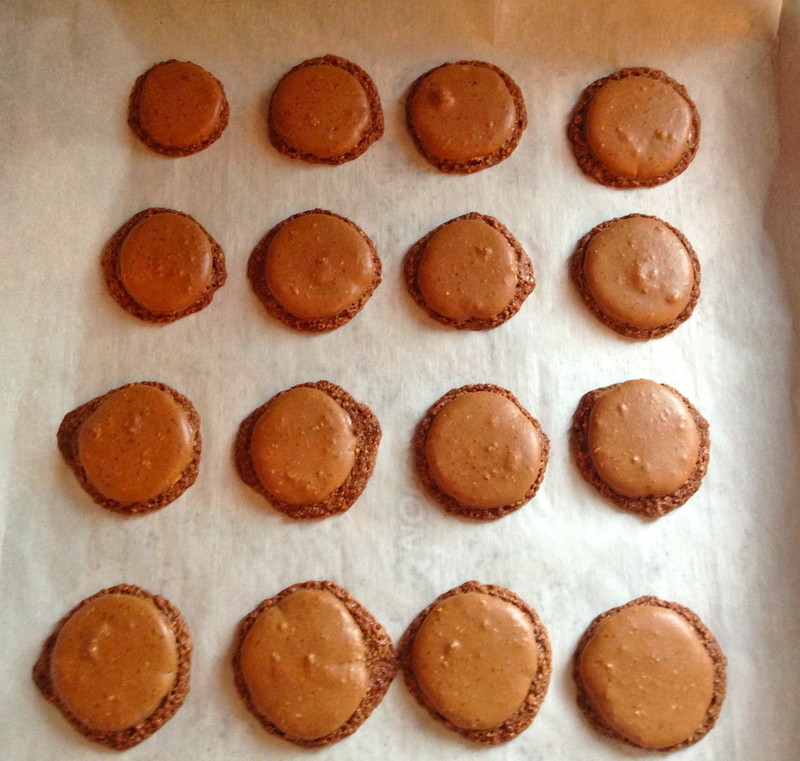 Let the macarons sit for about 30 minutes. This will dry the macaron and ensure even baking. Pop into the oven for 7 minutes at 350 degrees. Rotate baking sheet and bake for another 7 minutes. 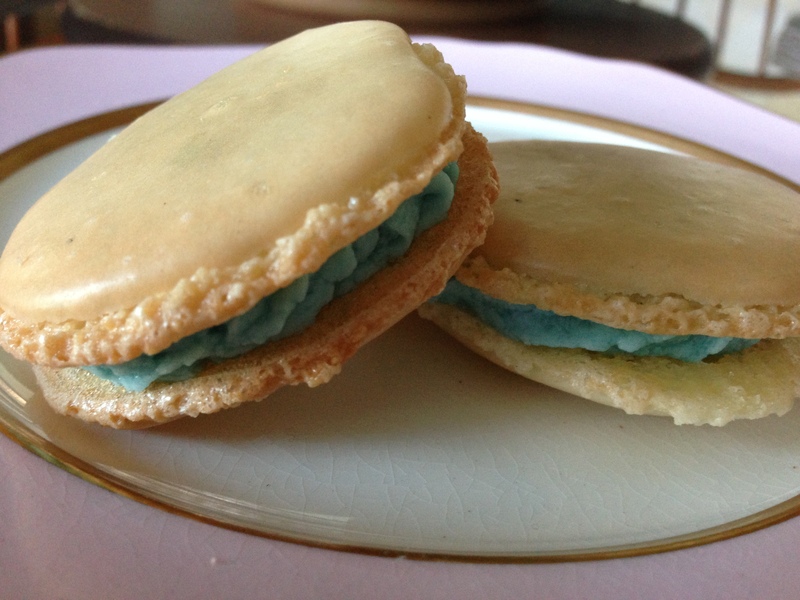 Take out macaron shells and let cool completely. 7. Create the ganache by chopping up the bittersweet chocolate and slowly mixing into a saucepan with heated cream. Take the mixture off of the heat for 1 minute and then add the butter. Mix until smooth and chill in the refrigerator for 30 minutes. 8. Take the chilled ganache and transfer into a piping/ziplock bag. 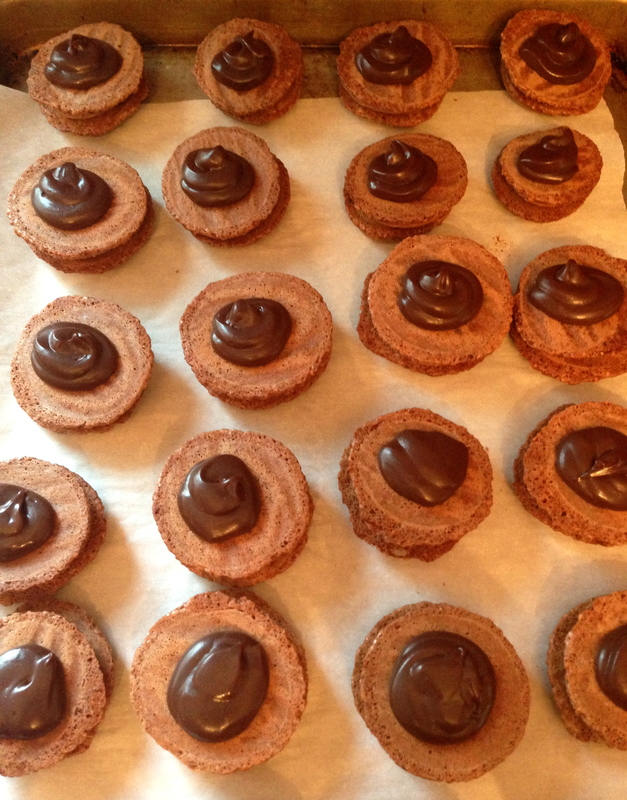 Pipe a cherry-sized amount of ganache onto half the shells. The other half of the shells will be used to top the macaron. 10. Serve on a pretty platter, be impressed with yourself and enjoy! Waking up morning after morning to the same old routine can often get, well, tiring! Who says you can’t make waking up a lovely and enjoyable experience? Breakfast in bed is one of my favorite ways to treat myself. Personally, the fear of dirtying the bed is silly… sheets and comforters can always be washed! It’s the feeling of relaxing in bed while eating a delicious and energizing meal that cannot be beat. 1) Find a fun and functional tray. One with legs or without is just fine! 2) Make a pot of tea or coffee. That way, you can have a few cups without having to get out of bed. Pair it with cream and sugar in serving glasses. 3) A glass of orange juice or milk is not only tasty but adds color to the breakfast display! 4) Pick your main meal. Whether is it oatmeal with berries, toast with peanut butter or yogurt with nuts, make it high in protein! 5) Accompany it with real silverware/plating and a pretty napkin. Remember, this is a treat… doing the dishes is worth it. 6) Fresh cut flowers from the garden… optional, but almost a necessity! Now, you have something to look forward to when you wake up in the morning. 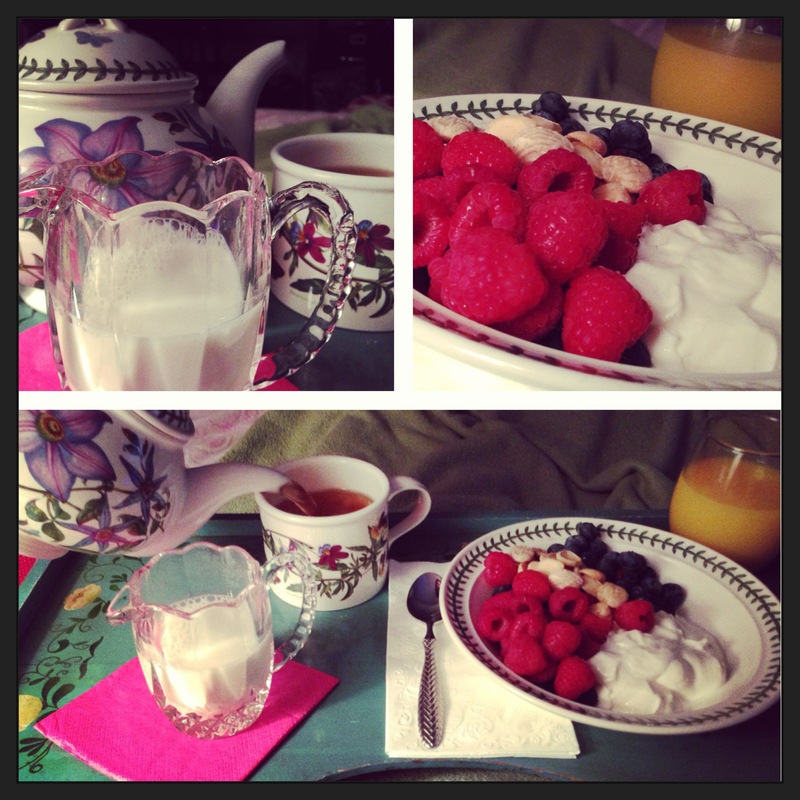 Give yourself a good 30 minutes to enjoy your meal, slowly wake up and get your mind ready for the day. Once finished, it’s time to get dressed and go do some wonderful things! 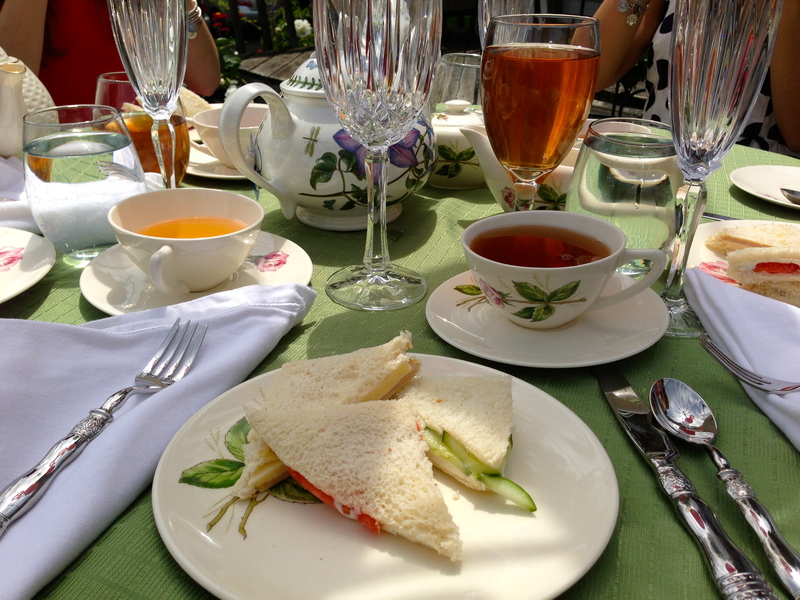 A couple of months ago, I posted an entry on how to create a proper afternoon tea. 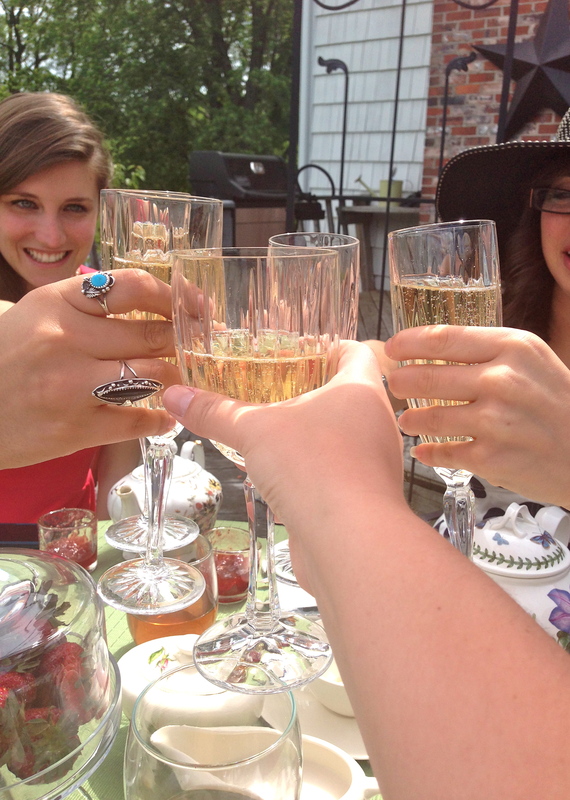 Unfortunately, the post was created in the middle of April and the weather was not conducive to the fabulous afternoon tea party I wanted to throw for four of my best girlfriends. 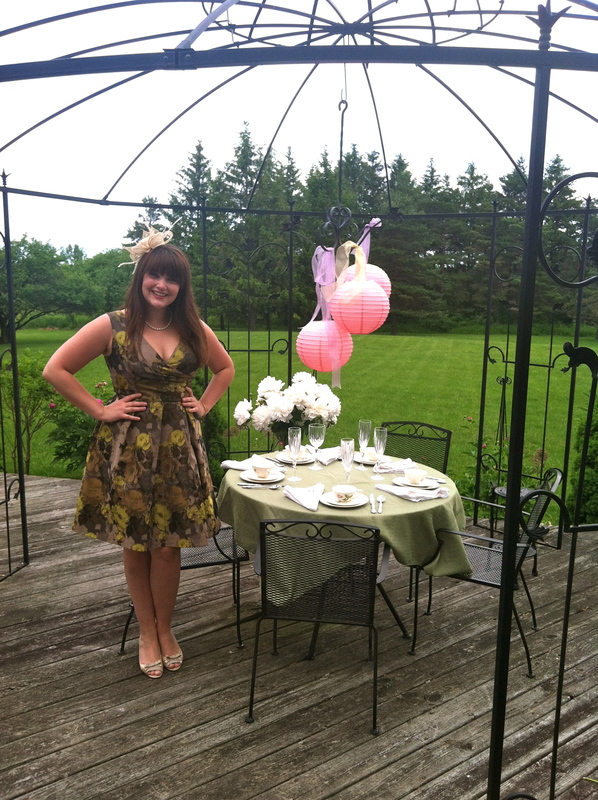 June proved to be the perfect month, as not only were the peonies in the garden in full bloom and the weather was lovely but also, all four of my girlfriends were home! 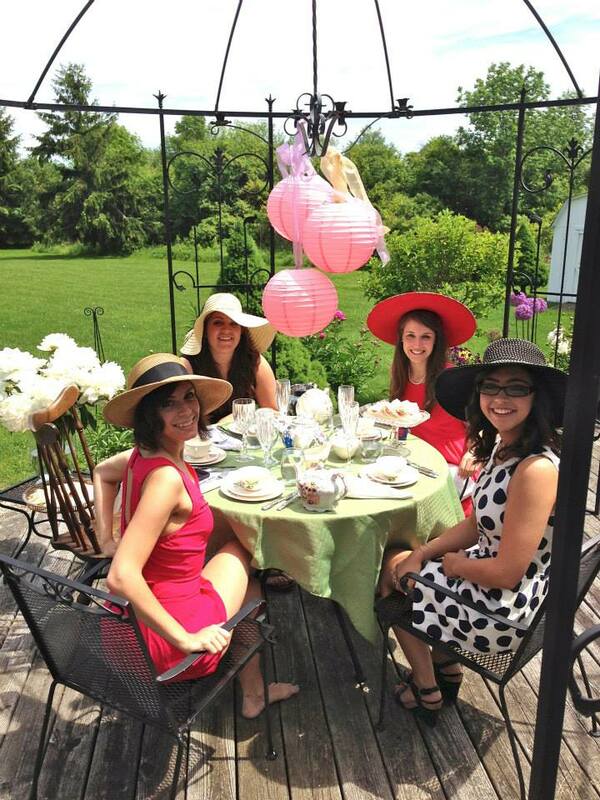 Therefore, I took some of my own lady advice, set a date and invited my girls over for a fabulous afternoon full of sundresses and hats. I followed the traditional standards for an afternoon tea, but of course, I had to put my own spin on things! I began with making a few pots of tea depending on the preference of each lady. Having a few tea pots around the table has such a fun and whimsical vibe and gives some variety… it is a TEA party after all! Additionally, I mixed up what my family calls “Witches Brew” or half lemonade and half iced tea to be served as a refreshing drink. Cucumber with cream cheese, Tomato with Boursin spread and Turkey with cheddar cheese and Dijon mustard. Each sandwich deviated a bit from the traditional servings (Cucumber, Egg mayonnaise with cress, Smoked salmon with cream cheese, Coronation chicken, Ham and mustard) but were just as delicious! 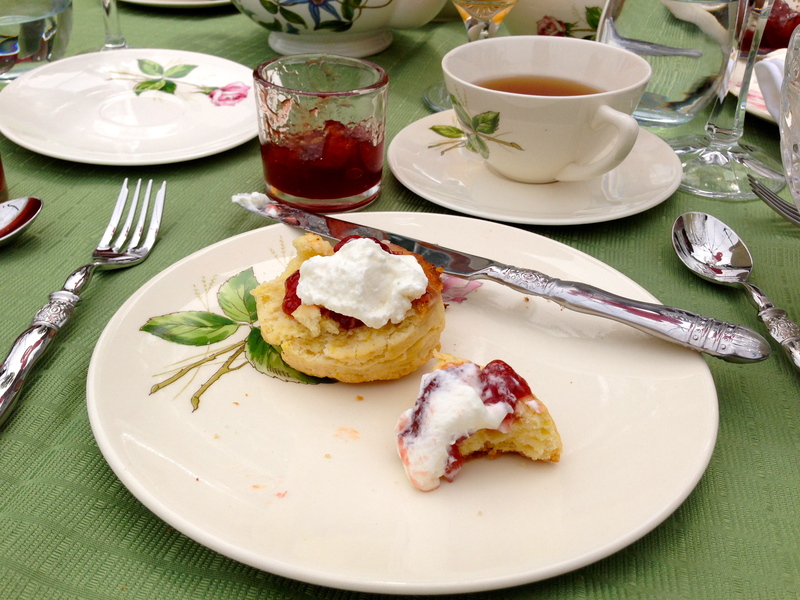 Scones with clotted cream and strawberry preserves were next. My favorite chef, Ina Garten also known as the Barefoot Contessa, always provides fool-proof recipes and I knew her scone recipe would be no different. I used Ina’s Cranberry-Orange Scone recipe, minus the cranberries. 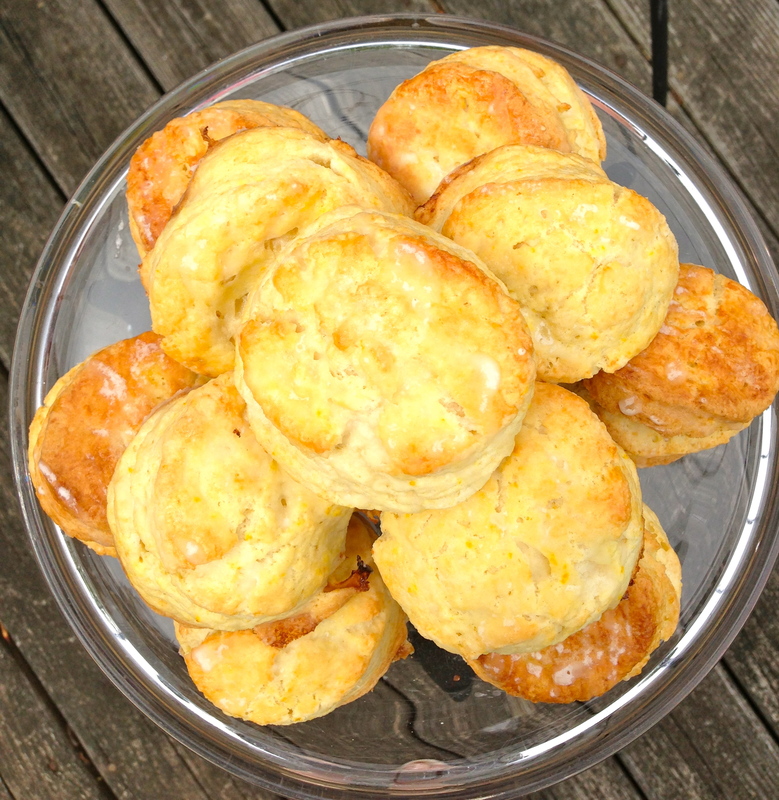 I wanted the scones to be unique but not overwhelming and the hint of orange flavor was perfect. Clotted cream is very difficult to find in the States, therefore I decided to make my own. Using a mixer, I poured in heavy cream, sugar and a little vanilla. Yes, this is not typically how clotted cream is made (simmering cream in a saucepan) but, for a summer day the result was light, fluffy and yummy. 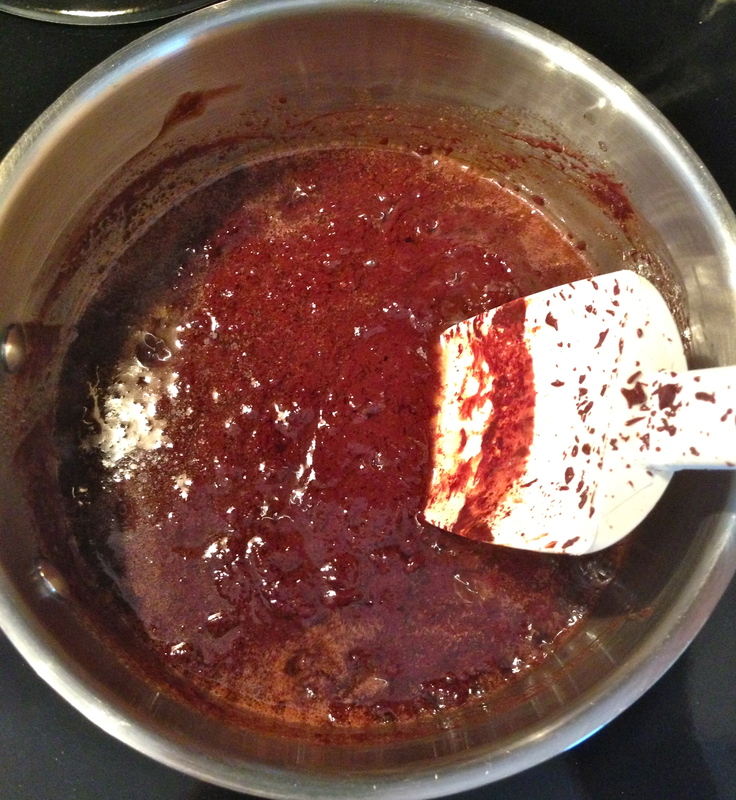 Store bought strawberry preserves put in a pretty bowl is the final step, simple and easy. The next “course” typically features an arrangement of pastries, tarts, cakes and chocolates. 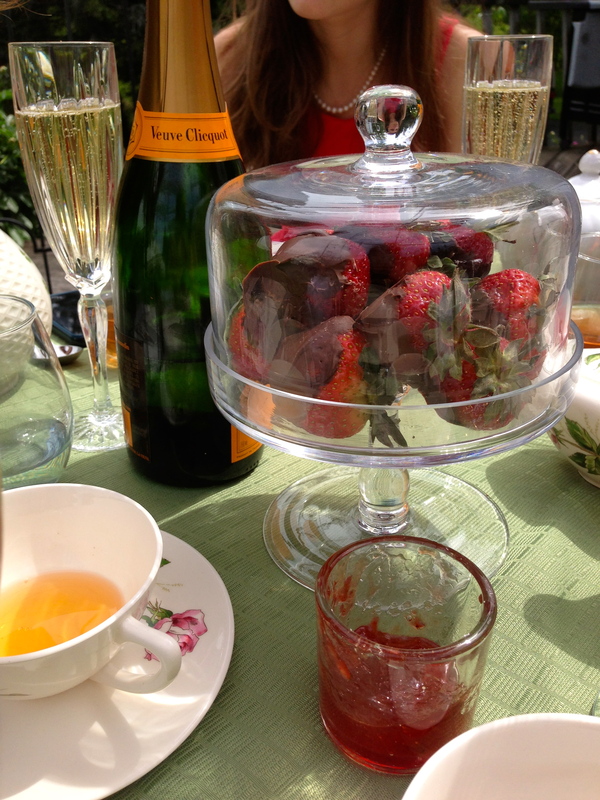 I opted for easy, chocolate covered strawberries with champagne for a lighter, more summery feel. I simply melted chocolate chips in a double boiler, dipped the strawberries and put them in the refrigerator to chill. The champagne needed no help on my end to be delicious! 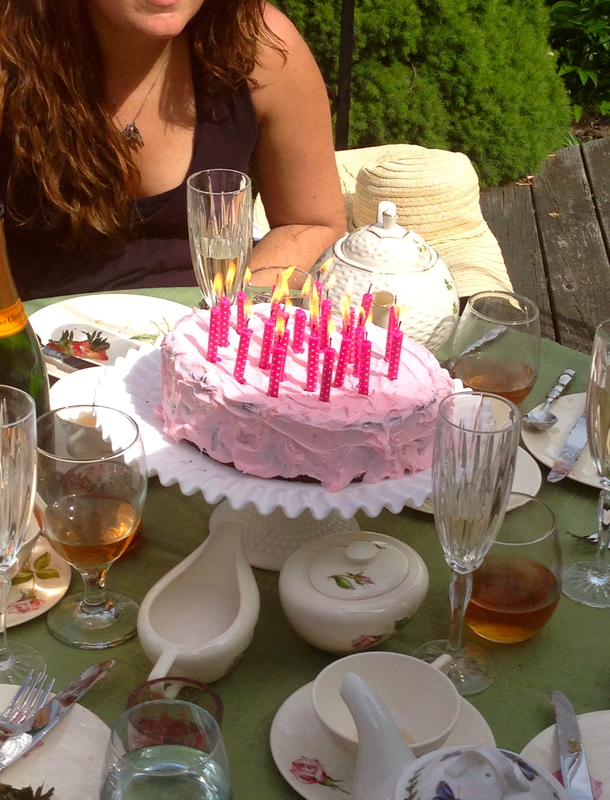 Finally, as a little surprise to celebrate all of our birthday’s throughout the year, I whipped up a chocolate cake with pink frosting, finished off with pink candles. The day was all I had hoped for it to be and more. Nothing warms the heart more than a hot pot of tea, scrumptious treats and fabulous friends. Every now and then, a lady needs to treat herself to something special. With all the pressures in today’s world, it is important for every woman to spend a little extra time (and sometimes a little extra money) on herself. 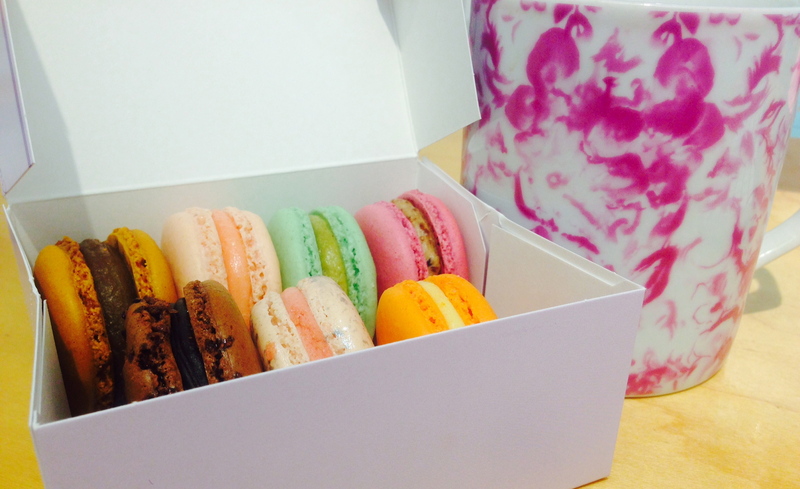 I am a personal fan of the delicious Laduree macarons, a luxurious and delicious French treat. Whenever I visit NYC, I try to make a quick visit to the Madison Avenue shop not only to grab a box of my favorite treats but also to look at the beautiful displays! Although the prices are often higher than what you may spend on a pastry, the experience is worth it. For deliveries, simply call the shop nearest to you and enjoy every bite!